During a regular noon Rotary Club of McHenry meeting at Uprooted, Don Tonyan, Sr. (Co-Chair of the Blues, Brews and BBQ’s Committee and the Service Projects Committee, as well as 2019 recipient of the Frank E. Low Award) presents Phil Bartmann (Blues, Brews and BBQ’s Committee member, 1994 recipient of the Frank E. Low Award, and our Club’s Rotary Foundation Chair) with Phil's Paul Harris Fellow plus five pin. Don Tonyan, Sr. is also a Paul Harris Fellow. These four subjects (Rotary Club of McHenry, Blues, Brews and BBQ’s, the Frank E. Low Award, and Paul Harris Fellow) serve to manifest and deliver service to others and community leadership. In fact, of the 31 recipients of the Frank E. Low Award from 1989 to 2019, roughly forty percent have been Rotarians. Consider becoming a Rotarian by contacting RotaryClubofMcHenry@gMail.com. Consider becoming a sponsor of Blues, Brews and BBQ’s by contacting RotaryClubofMcHenry@gMail.com. 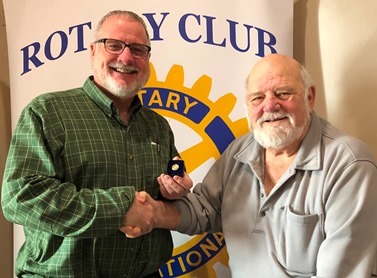 Pictured below from left to right are members of the Rotary Club of McHenry: Don Tonyan, Sr. (Co-Chair of the Blues, Brews and BBQ’s Committee and Service Projects Committee, Paul Harris Fellow, as well as 2019 recipient of the Frank E. Low Award) and Phil Bartmann (Blues, Brews and BBQ’s Committee member, 1994 recipients of the Frank E. Low Award, and our Club’s Rotary Foundation Chair, pictured below receiving his Paul Harris Fellow plus five pin).